Mike Perry’s landscape photographs in the series Wet Deserts are realised on a grand scale. 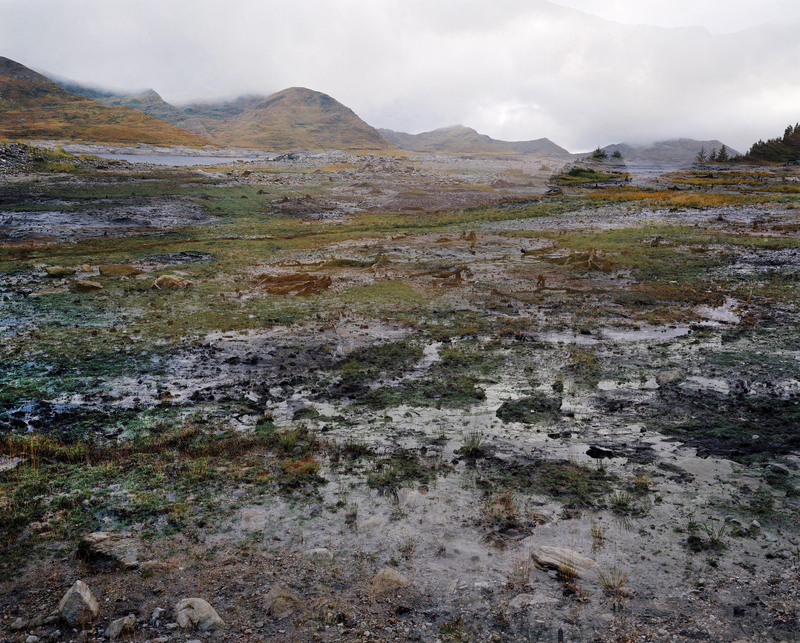 His work, however, differs markedly from the cadre of photographers such as Edward Burtynsky who have made their name by creating large-scale works that record manufactured landscapes and environmental catastrophe. Perry eschews their need for elevated platforms (and more recently, aviation), to reveal the breadth and depth of these man-altered landscapes. 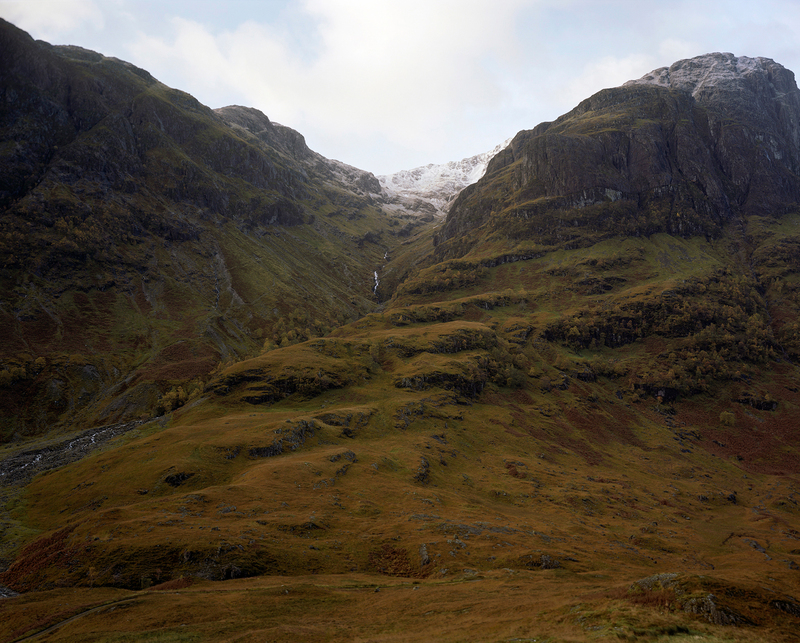 Whereas Burtynsky travels the globe to document extreme human impact, Perry focuses his gaze on mundane and typically overlooked locations here in Britain, often in places commonly referred to as areas of natural beauty, our national parks. 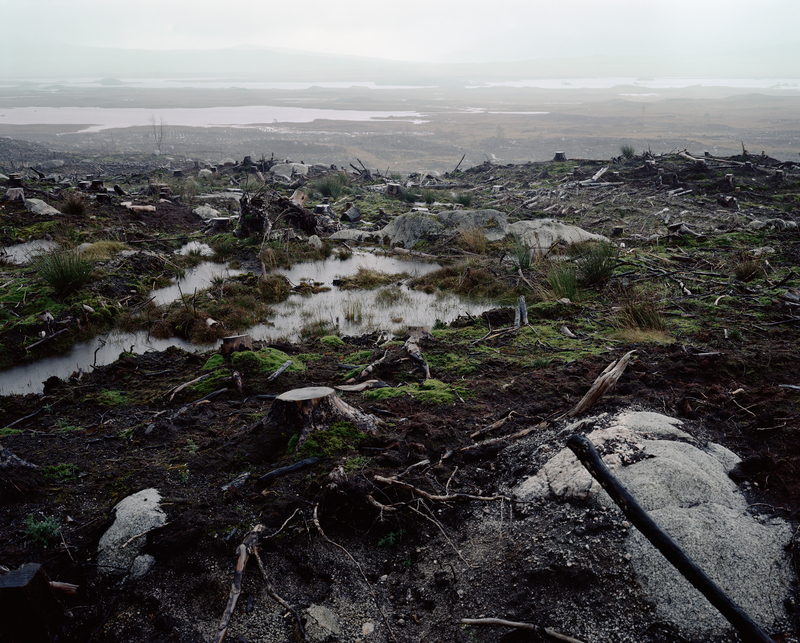 Thus he does not offer us dramatic aerial vistas of oil polluted landscapes, but low-angle, near distance images of charred scrubland and landscapes left barren from tree-felling or over-intensive sheep-farming. 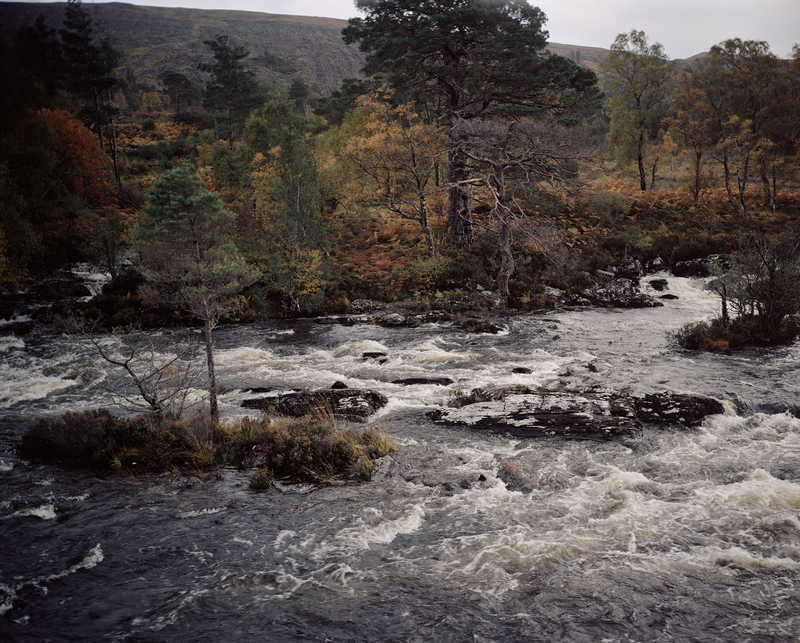 As Skye Sherwin observes “Perry’s photography, is not concerned with the campaigning rhetoric of straight environmental documentary. Rather it poetically alludes to what we might be leaving for future generations”. 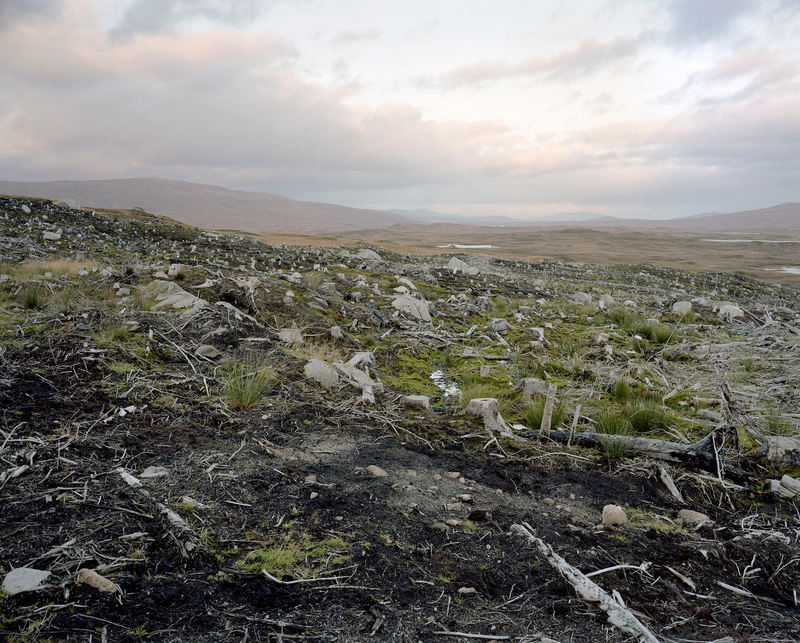 Using a large format analogue camera and combining painterly aesthetics with a hard edged environmental narrative, the photographic images in Wet Deserts shed a very different light on the health of the upland landscape than one is accustomed to seeing in tourist brochures or romantic paintings and landscape photography. Loch Cluanie lies shielded by Highland mists at the south east end of Glen Sheil. A huge reservoir stretching for nearly 680 metres from west to east, it is contained by the Cluanie Dam constructed in the 1950s as part of the Glenmoriston hydroelectric project. Tourist shots of Loch Cluanie show spectacular, panoramic vistas, suggesting the elemental, epic landscapes of natural Scottish lochs. 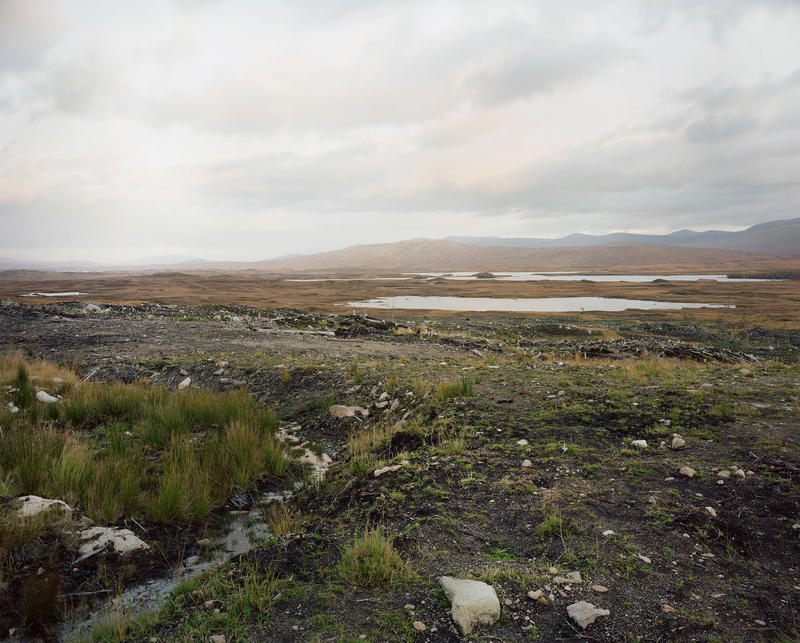 In contrast, Mike Perry’s large scale series of photographs of Loch Cluanie present the viewer with a puzzling – at times indecipherable – epic landscape genre which explores and indulges the uncomfortable margins of such tourist sites. 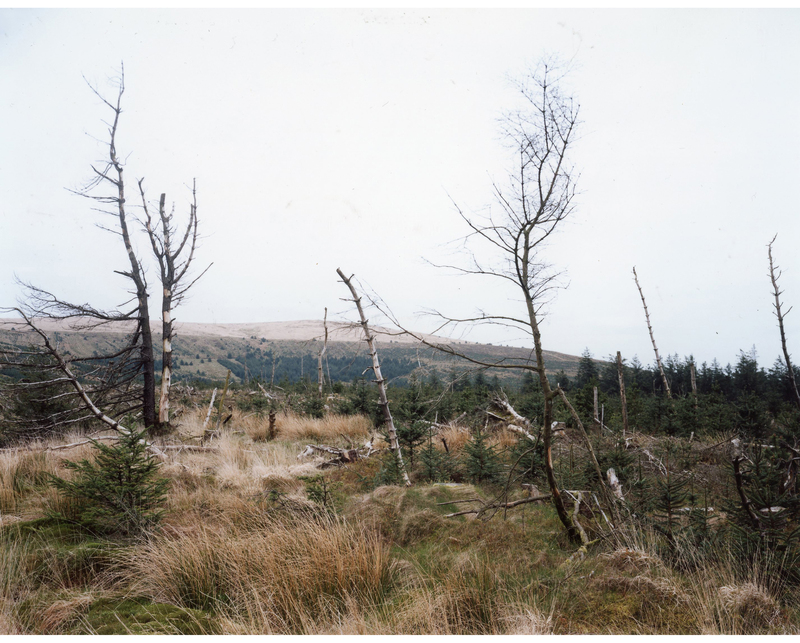 Part of a series of inland photographs shot on 10×8″ format while driving around remote locations in Wales, Scotland and Ireland in 2005-2008, these images appear both painterly and visually complex. Misty, barren landscapes with high horizons and speckled, muted colours can deceive as shallow surface abstractions, replete with formal effects that mimic paint on canvas. 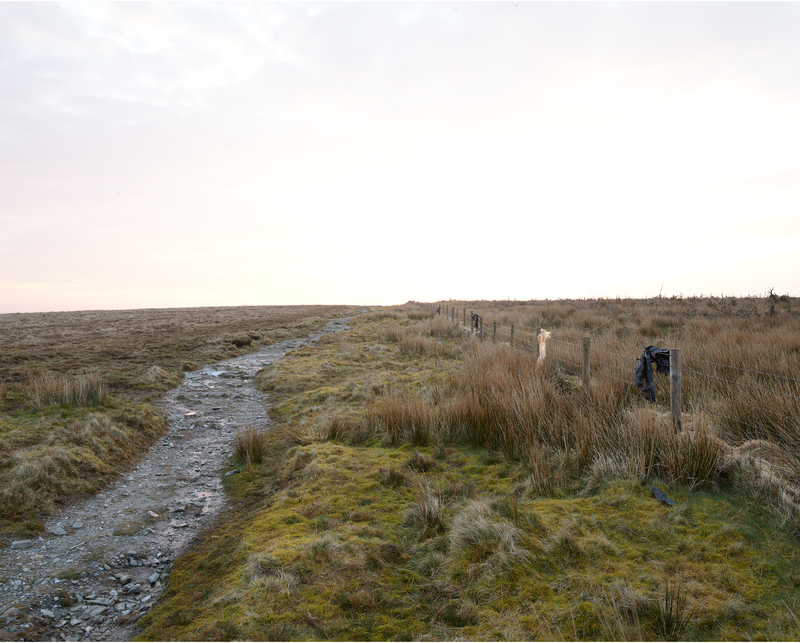 But on closer inspection they can also evoke more troubling narratives on the relationship between ‘nature’ and the effects of human intervention on landscape, water and geology. 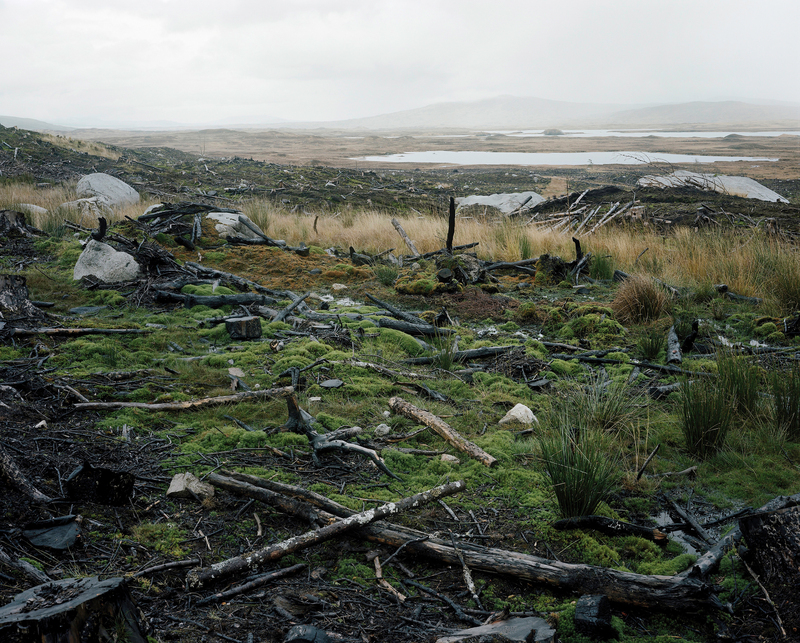 Works such as ‘Cross, Rannoch Moor, Scotland, 2008’, ‘Burnt Gorse, Preseli Hills, Wales, 2005’, ‘Clearing, Presili Hills, Wales, 2007’, ‘Fence, Kerry, 2007’ offer bleak, dehumanised vistas of scarred or ravaged nature, prompting musings on unpredictable weather changes or irresponsible depletion of natural resources. 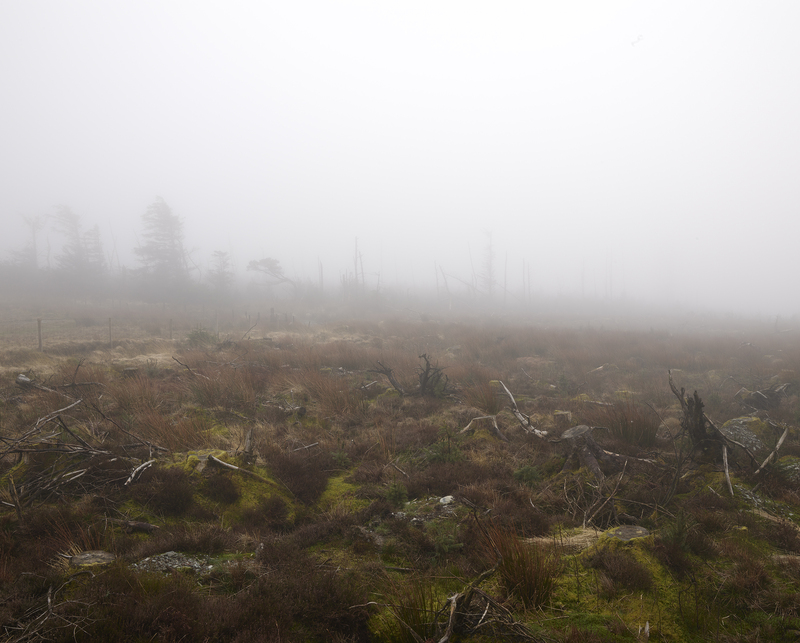 At the same time, Perry seems to revel in the painterly and poetic opportunities offered by muted winter light and monochromatic tones, grey mists, waterlogged bogs and austere, treeless moors. He has expressed pessimism about climate change and the future of the planet. Yet his photographs tease the viewer with more ambiguous meanings. They are suggestive ‘documents’ which seem to hover uneasily between recording the effects of climate change (or simply the elemental ravages of nature) and seductive, painterly surfaces. Perry’s ‘Wet Deserts’ are less iconic than melting glaciers. 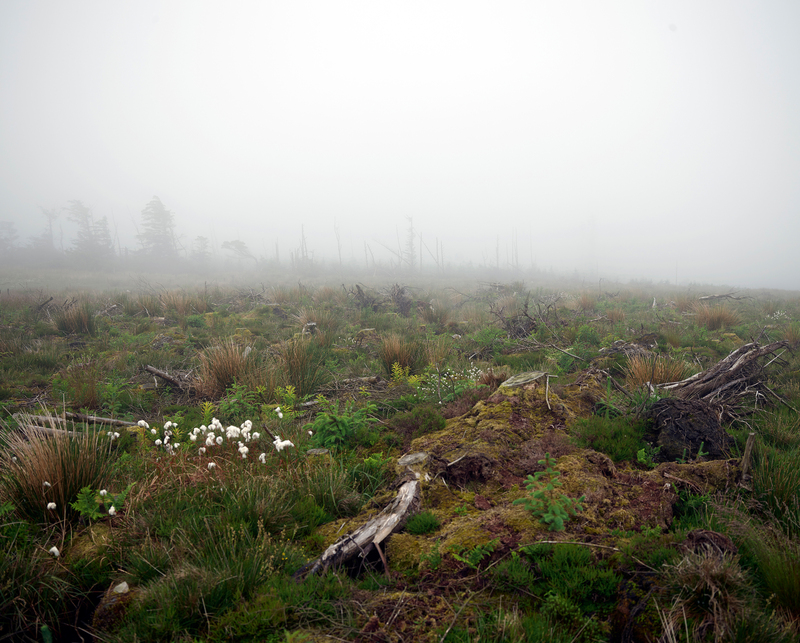 Yet they invite reflection on what these uninhabited, marginal landscapes might signify in an era threatened by ecological disaster. Gill Perry is Professor of Art History at the Open University. She has published books and articles on modern and contemporary art and is co-chair of the conference Radical Nature at the Barbican on 12 September, 2009.